Welcome to Day #21 of Chocolate and Peru Theme Week. 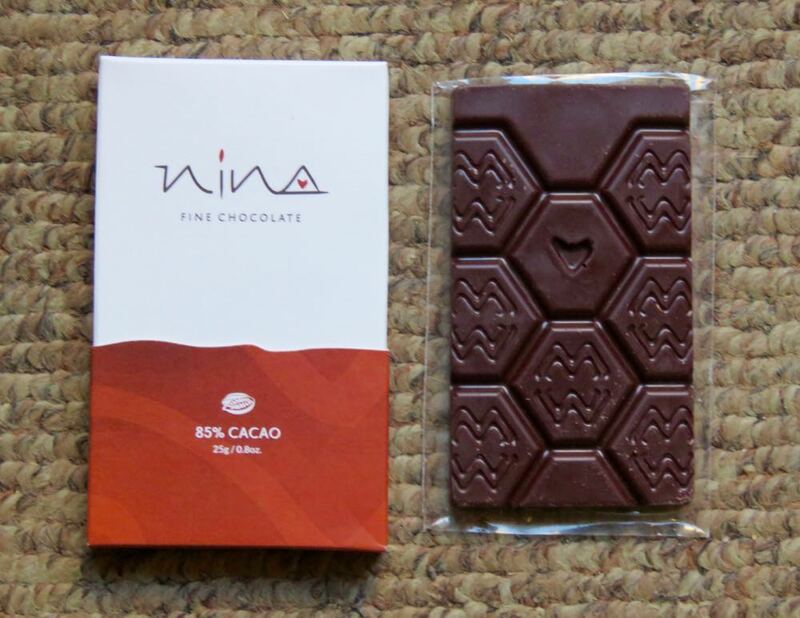 Today's Nina Fine Chocolate 85% Cacao bar was produced and distributed by Proyecto Chazuta (Chazuta, San Martin, Peru). This bar was part of an attractively packaged 4-bar assortment pack that contained 45, 55, 70 and 85 percent cacao bars. Today's 85% cacao chocolate was similar to yesterday's 70% cacao bar. It had an aroma with chocolate, fruit (slight vinegar*) aroma with a very faint slightly darker, almost earthy note. And, like yesterday's bar, the flavor had a (slightly less pronounced) sweet and sour tart fruit acidity that one could feel in the throat. The bar was sweeter than many ultra-dark bars, in a pleasing, balanced way.) The finish lingered a bit with a smooth fade, and was accompanied by a very slight astringency. Due to it's slightly higher calorie count than yesterday's 70% bar, it may have had slightly more added cocoa butter (which tends to moderate stronger flavors in ultra-dark bars). 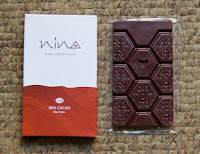 *A high percentage of bars featured this month made with Peruvian cacao, particularly those made in-country (in Peru), have had a trace of sweet/fruit vinegar to them. This flavor almost always originates early in the chocolate making process, and can result from fermentation choices. In some cases flavor can be characteristic of local conditions, or it could be the result of deliberate fermentation choices (e.g. co-fermentation or secondary fermentation of cacao beans with fruit), resulting in a characteristic regional flavor profile.